Who doesn’t enjoy making it as easy as possible to prepare all our mouth-watering recipes? Everyone does! There is no other small kitchen appliance I can speak higher of than the Presto Professional SaladShooter Electric Slicer and Shredder. No matter what you have plans to make, salads, desserts, pizza, casseroles, or any other meal, you’ll thank Presto for making it faster and simpler to whip out. Presto Professional Salad Shooter Electric Slicer and Shredder has the ability to prepare needed ingredients for you within seconds. Your old cutting board and knife would not give you even extra thin slices every time, and slicing mandarin style takes too much effort and time. Whether your recipe calls for shredded or sliced, SaladShooter can do the job. The Presto name alone is enough to inform you that the SaladShooter is highly durable. It is made from a very high-quality of plastic, giving it a build that’s durable. The exterior is a clean white look with the Presto logo name printed on the side of the appliance. It is compact and the build feels sturdy and solid. Presto SaladShooter is not an appliance I would have out for the show in my kitchen, however. It doesn’t have a bad look, however, it’s more of a plain design; whereas other appliances are black or have some color to them. Although, this is a personal preference, while others may prefer white. Small and light in size at only 12.5 x 11.8 x 5-inches and just slightly under four pounds. The lengthy five-foot long cord is included allowing you to move around some during use. No need to stand right up the electric socket to slice and shred. It comes with four interchangeable cones. Cones are all made from the same high-quality plastic as the base with stainless-steel heads. These let you shred, make regular, wavy, and thick slices. The shredding cone is for medium-grade shreds and is designed for the purpose of shredding cheese. However, thicker-grade and fine-grade are available for purchase as an added accessory. Properly assembling this appliance is important for it to operate. Also, unless in the off position, the food chamber is not removable. With the appliance turned to the off position, attach the food chamber to the base. Next, place the shredding/slicing cone right for your recipe, and lock it in with the retaining ring. Check to be sure accessories are all in the right position and locked. Now, place ingredients you want shredded/sliced, such as carrots or cheese, into the chamber. Push down on the food guide while pointing the SaladShooter towards or over where you want the ingredients to go. An example: While pointing the appliance chute into or over a salad bowl, all food will shoot out of the food chamber and into the bowl. No need to transfer after shredding or slicing. Or, if making homemade Macaroni-and-Cheese, you can easily hold the base directly over the macaroni and skip the bowl. Pro tips: If vegetable slices are too thin for your recipe, make them thicker by applying more pressure while pushing down on the food guide. For effortless shredding or slicing, I recommend cutting ingredients into the size to fit into the food chamber. Depending on the size of the potato, I can get away without cutting them before placing them into the SaladShooter. However, food can become stuck in the chamber if not sized to discharge correctly. While pushing down on food guide, make sure to use even pressure. If you want slices to be short, place ingredients upright in food chamber. For elongated, place in chamber horizontally. 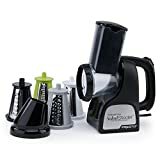 I use this Presto SaladShooter to shred a variety of cheeses for different recipes, carrots, chocolate, and many other foods. Using the slicing accessories, I slice cucumbers, potatoes, onions, apples, and much more. One of the wonderful things I love about this shredder/slicer is the ease of clean up. Once all your ingredients are done being sliced or shredded, simply remove the restraining ring, cones, and food chamber by turning the ring. Accessories are dishwasher safe or easily wash clean by hand with dish soap and water. Normally, the base would only need a wiping down with a paper towel. However, if you prefer, a wet dishcloth can also be used. First, the pros and there are many. Quickly shred/slice ingredients for your recipes without any exertion. Assembly and disassembling are fast and easy. No special requirements for cleaning. Cones are safe for dishwasher use. As small as this appliance is, storing it is amazingly easy. In a large kitchen drawer or cupboard is where I usually keep my base and accessories. An affordable price at Amazon. Next the cons, which aren’t many. I love the Presto Professional SaladShooter and am unable to find much wrong with it. It’s not great for shredding or slicing soft foods and limits you to mainly foods which are firm. I wouldn’t place this on the con list, however, this appliance is loud while pushing your ingredients down, but with the amount of time and work saved for results, you won’t mind. As I already stated, I absolutely love this appliance. Don’t know what I did before I had one, and would quickly purchase another if/and when this one breaks. At an affordable price, quickly and effortlessly, slice and shred ingredients for all your favorite recipes. Shoot Salad the Right Way! A salad shooter can provide you with the ability to put together some of the most delicious dishes easily and effectively.